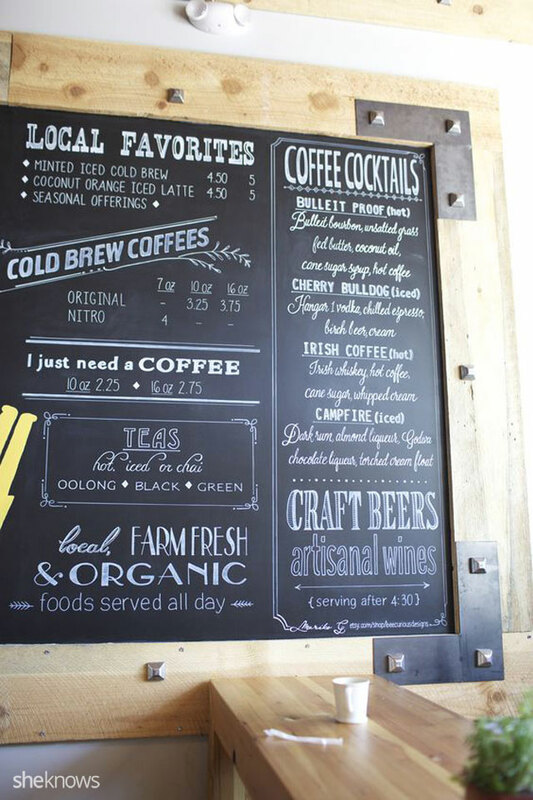 Recently, I had the opportunity to paint an enormous chalkboard menu for a local coffee shop here in my hometown. The right side of their giant chalkboard menu was my introduction into the world of spiked coffee. 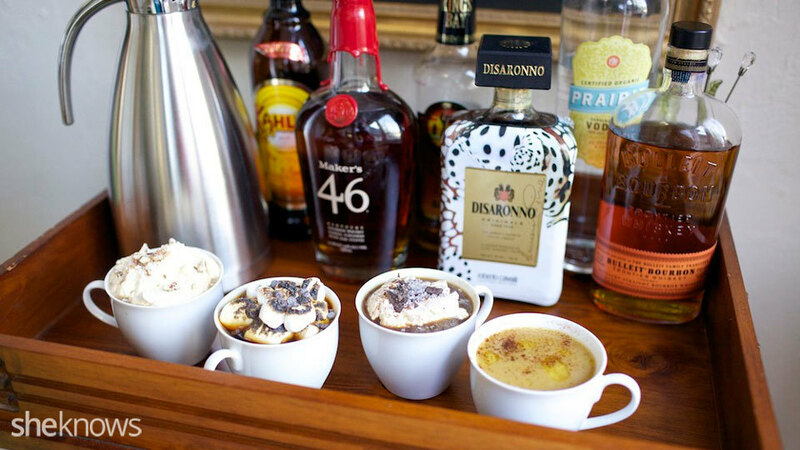 As you can see, this place has the most amazing spiked coffee drinks, which inspired the concept of a home coffee bar, perfect for any occasion from informal gatherings with a few close friends to your next big party, or even a wedding. 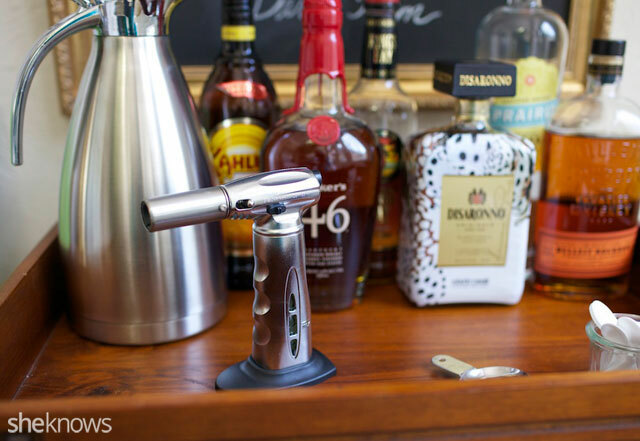 You’ll want a kitchen torch for one of my coffee cocktails. And, after all, who doesn’t like to light something on fire? I’d say it’s a guy thing, but light this baby up, and I guarantee the guys and the gals will think it’s just the coolest thing they’ve ever seen on a bar cart. If you want to take this concept camping or to a tailgate party, just pack your favorite spirits, a carafe of coffee, a bag of marshmallows and this little gadget. It’s sure to be a hit! 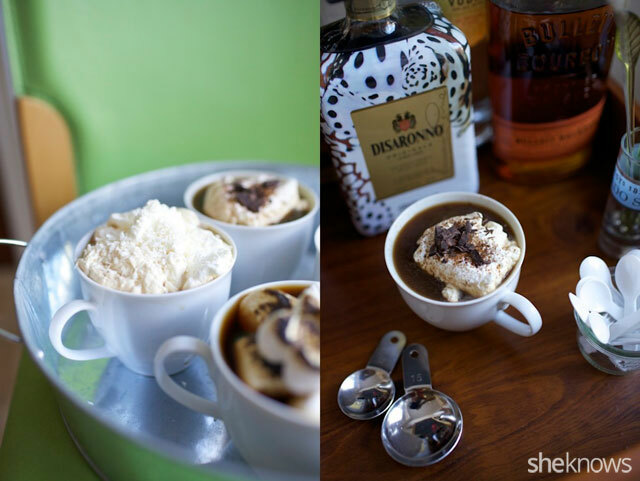 Here are four recipes I’ve played with that are sure to add some fun to your next party. You can print out the recipe cards, cut them out and set them on the bar so guests can make their own drink. 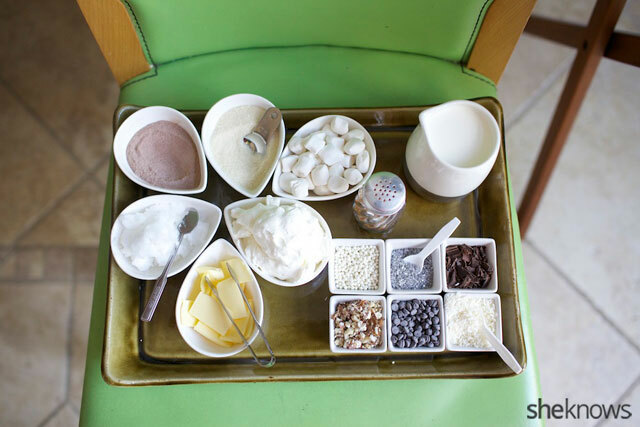 They can follow the recipes or go “freestyle” with some of the extra toppings to create their own signature spiked coffee drink. 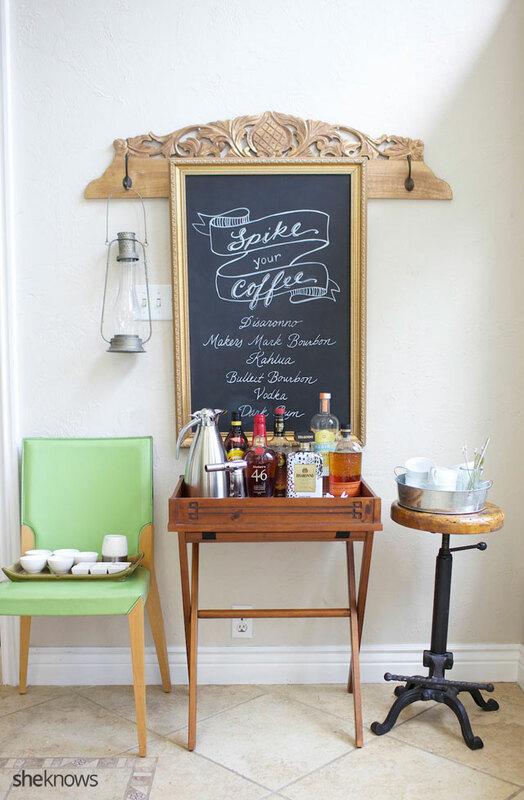 Print out this handy spiked coffee bar shopping list/checklist to gather your ingredients. Grass-fed organic butter is one detail that is important for all your bulletproof coffee snobs. Makers Mark brand bourbon is especially good paired with hot coffee. My checklist has ingredient toppings for the recipes listed, but for more variety you could also set out chopped almonds, mini chocolate chips, sugar crystals, pearl dragees, silver sprinkles, chocolate syrup or caramel drizzle. 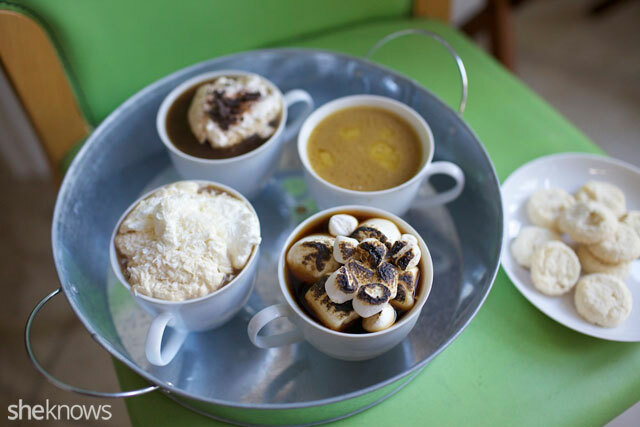 I love homemade marshmallows for torching; However, if you don’t have time to make a batch from scratch, Dandies All Natural marshmallows are the next best thing to homemade. 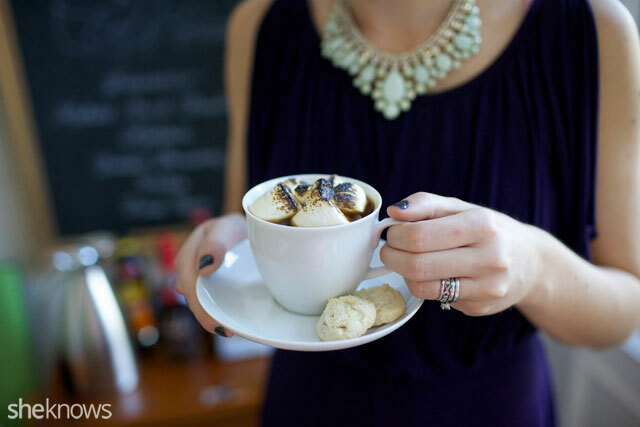 Shortbread cookies or biscotti are the perfect accompaniment for this spiked coffee bar, so be sure to leave room for a small plate of a little snack within easy reach. I can’t tell you how much I enjoyed developing these recipes. Coffee is my comfort food, and adding all the different spirits and toppings just took it to a whole different level. I hope you enjoy them as much as my friends and family did! Top with whipped cream and unsweetened coconut. Add whipped cream, cinnamon and chocolate shavings. Top with marshmallows and torch until caramelized and toasted.